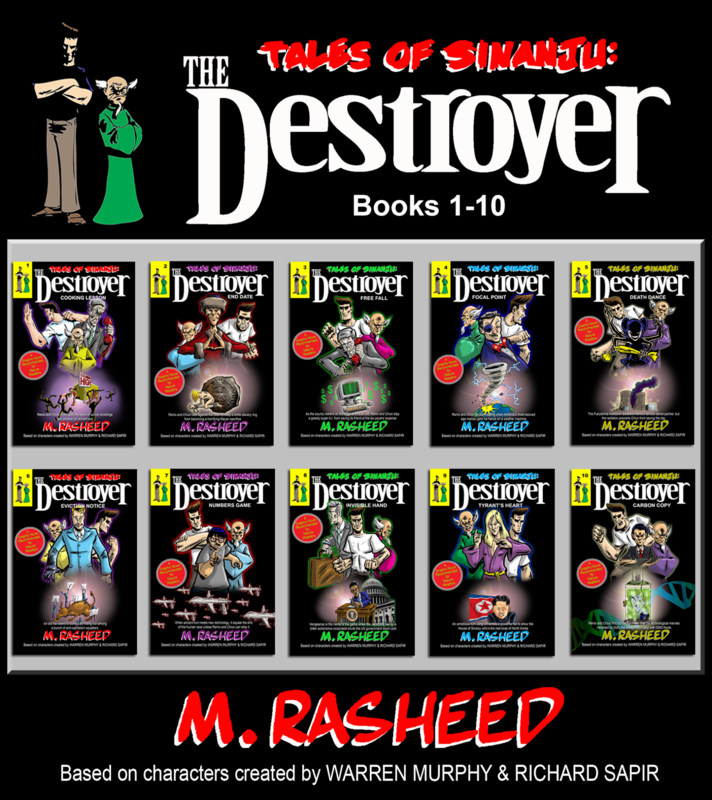 It’s been decades since The Destroyer paperback novel series by Warren Murphy and Richard Sapir has graced the comics world with its Sinanju awesomeness, but now true fan M. Rasheed -- in partnership with the heirs of the Warren Murphy estate -- has unleashed the funny book flood gates. 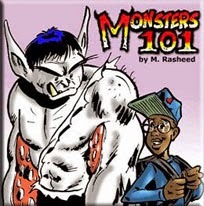 The award-winning cartoonist brings the quirky, action-packed, ultra-violent, and very fun Men’s Adventure tale to a ten-book, 66 page graphic novel series as only the author of Monsters 101 can! 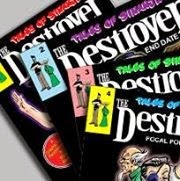 Any Destroyer fan will be proud to have this super-set in their collection, featuring brand new stories full of fan-favorite villains, and a special 6 page tale that ends each title with a ‘Scrolls of Sinanju’ journal entry, each written by some of the greatest masters as they describe a key point of the series' mythology. 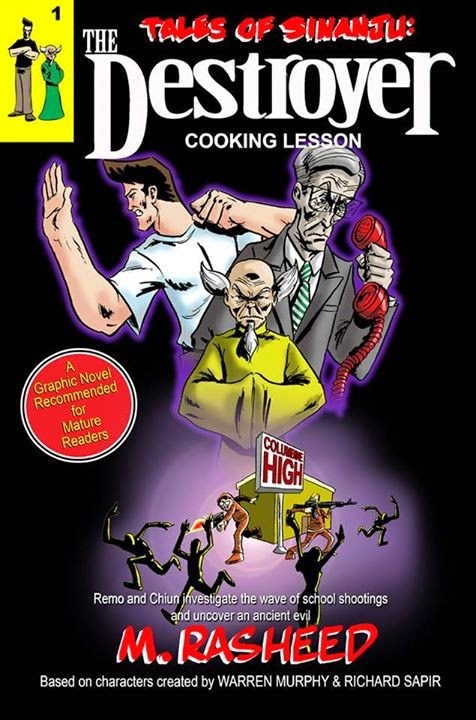 These comics will be a great starting point for new readers interested in jumping into the 150+ novel mainstream tales as well! 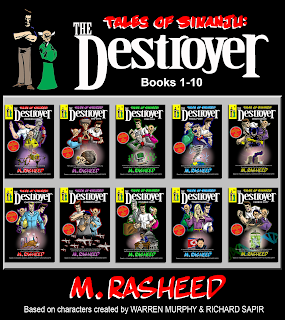 TALES OF SINANJU: The Destroyer, books 1-10 by M. Rasheed (based on characters created by Warren Murphy & Richard Sapir) are now available exclusively from Second Sight Graphix. MANY SHOTS, MANY KILLS – The long-suffering underdogs of America's youth are mad as hell and they're not going to take it any more! But nowadays they're using the deadly recipes of a cookbook of anarchist infamy to slaughter the guilty and the innocent alike. Unfortunately for the nation's innocents caught in the crossfire the trend is catching on and growing to epic proportions. Only Remo and Chiun have the skills to shelve the book permanently. But why has Robert Powers, the author who had denounced his evil book, backtracked out of a peaceful life to spread this new message of guns and death? And who is whispering the secret voice in his ear that dreams of both ancient conquests and bloody vengeance against the House of Sinanju? >> SNEAK PEEK! 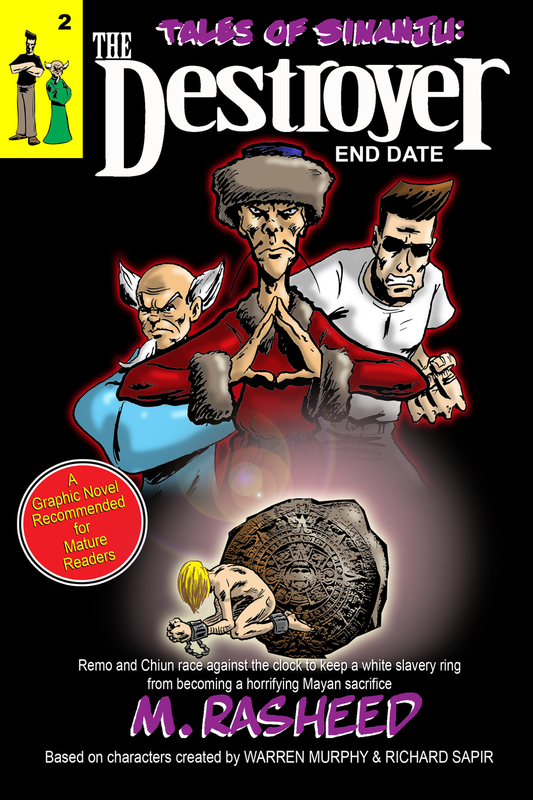 THE VERY LAST CALENDAR – The insidious Wu Ming Shi needs quick cash for a mysterious project in Mexico, and as the clock ticks down to the infamous Mayan calendar end date, this can't be good. CURE's computers suspect white slavery mixed with ancient sacrifice rituals may be in play, and time is running out! 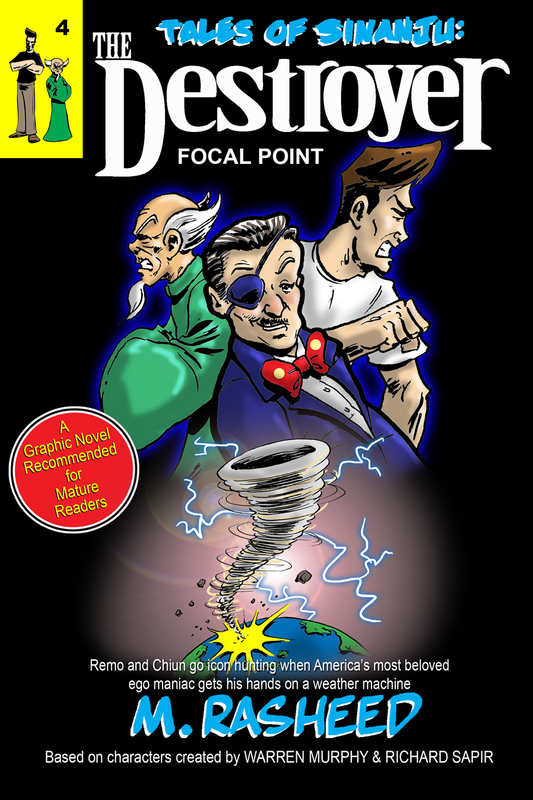 Harold Smith sends Remo to investigate, but the Devil Doctor has no interest in the Night Tiger American agent. It seems the grand ambitions behind the evil mind may just be ready for the ultimate revenge scheme, with Chiun as the star of the show. >> SNEAK PEEK! DANGLING OFF THE EDGE – As the country gets woozy from the continuous partisan back and forth, tipping the Fed precariously over the edge of a financial fiscal cliff, Chuck Richardson's billion-dollar defense contracting firm is hardest hit by the ensuing sequestration cuts. 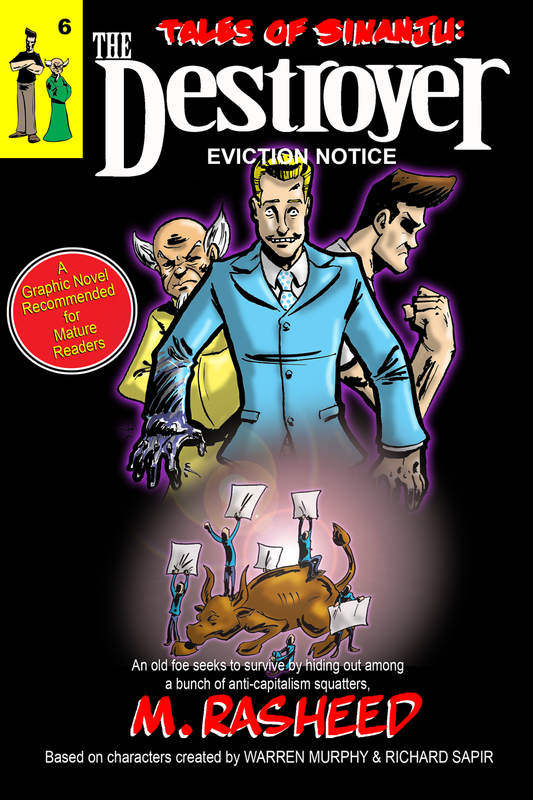 The money-stupid businessman panics until an old CURE foe reaches out to him to ensure Chuck it will take money from anywhere to make sure he continues to make a profit. 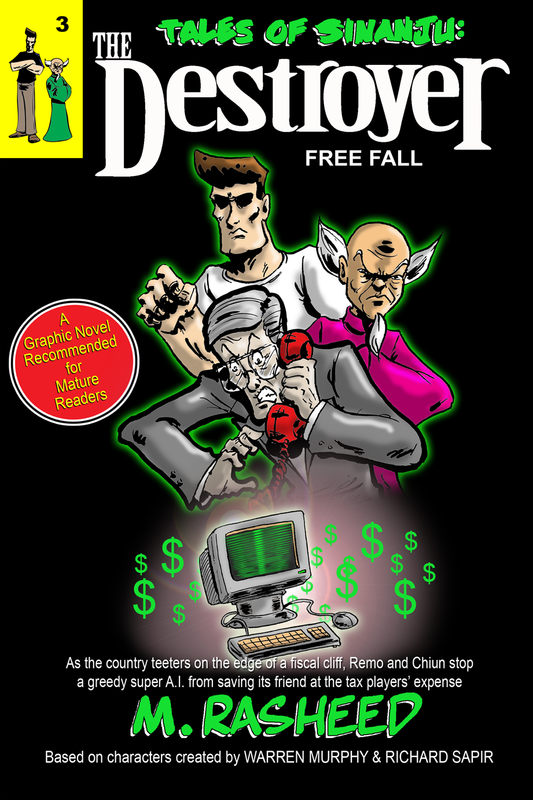 Remo and Chiun go on a man (and Artificial Intelligence) hunt to keep the greedy duo from making the nation's budgeting woes even worse. >> SNEAK PEEK! A HAPPY PLACE TO DIE – Sam Beasley, America's most beloved inventor, entertainer, and billionaire, has long had his sights on Japan as the site of his next mega-amusement resort complex. Unfortunately the Japanese leadership has failed to be equally enthused over Uncle Sam's selfishly insane visions, and have rejected them again and again. Harold Smith is forced to send Remo and Chiun after Beasley when his refusal to accept "No means no!" leads to tens of thousands of Japanese corpses, and a new plan to make the islands his once and for all. >>SNEAK PEEK! THE MOST TERRIBLE DANCE OF ALL – The whole world watches the awful destruction and climbing death count in the wake of the devastating earthquake that reduced Japan to rubble. 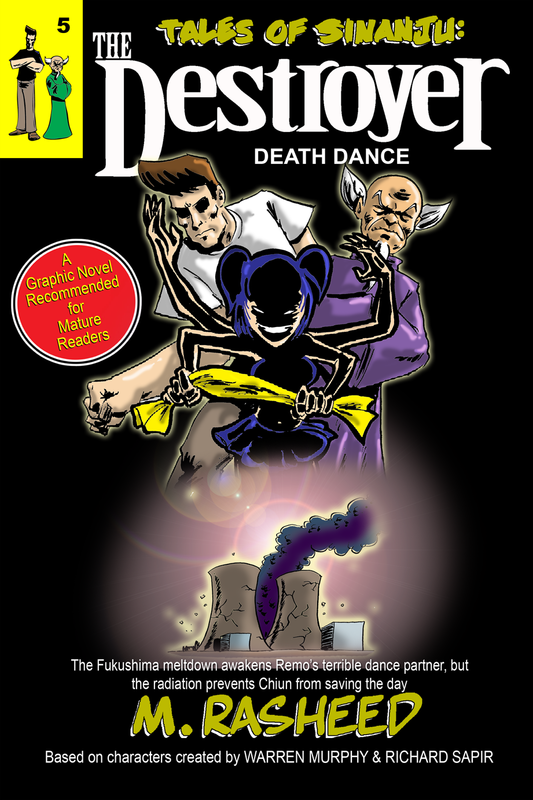 But an otherworldly set of eyes also watches, and schemes, as Kali the Terrible uses the radiation spill from the Fukushima reactor leak to plan the ultimate dance and spread destruction worldwide. A desperate Harold Smith wants to stop the problem at its source, but not even the House of Sinanju can stop deadly waves of radiation spillage... especially when it comes with a murderous dark goddess in tow. >>SNEAK PEEK! 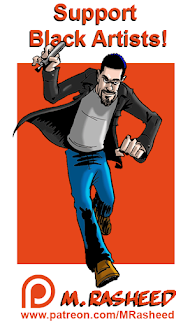 SLACKER NATION – The over-educated, cynical, and furious Calle White leads the voice of his generation. Demanding an equal share of the massive wealth enjoyed by the smallest percentage of the nation's populace, the angry 'Squatters' gather at a bemused and irritated Wall Street, refusing to leave until the balance of power changes. 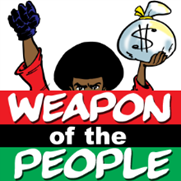 Dr. Harold W. Smith considers the group ultimately harmless, until Mr. Gordons shows up, attracted to the demonstrators' message of an ascended survival into true prosperity. 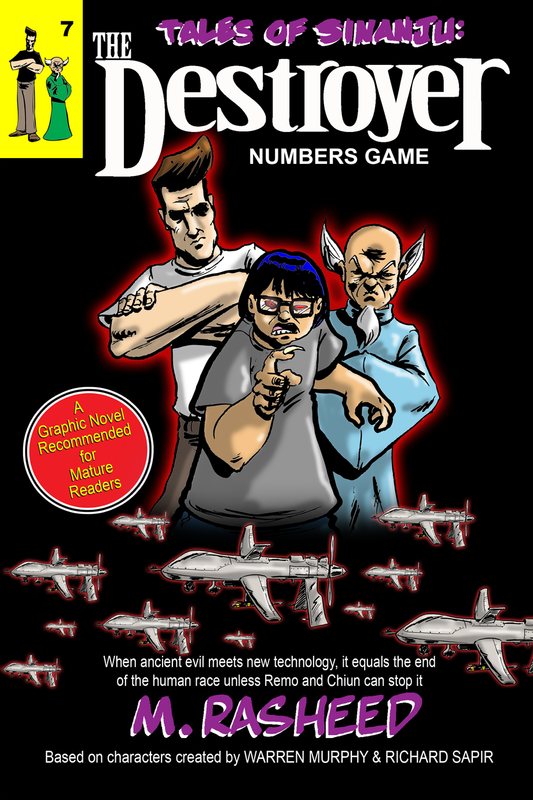 Lending his potent voice to that of an already agitated crowd, Remo and Chiun find that they really have to stay focused or the desperate robot just might even the score. >>SNEAK PEEK! AERIAL INFECTION – Long has the fiendish Chinese Vampire sought to turn all of humanity with its hive mind madness. Possessing supernatural powers and a terrifying, single-minded focus, the tribe should have been successful centuries ago, but the mighty House of Sinanju has been there to stop them in their tracks time and time again. Today the lead creature known only as The Master has changed tactics. Taking advantage of their ability to infect anyone, the vampire has gained the ability to command modern technology. Now the power of the drone represents a global threat greater than ever, with the two Masters of Sinanju focused right in the cross-hairs! >>SNEAK PEEK! SHUT HER DOWN – The President of the United States has grown used to receiving push back from his political rivals across the aisle, but nowadays the heat is rising to a feverish pitch! The loudest voice among them comes from a fed up Congressman who would fire the POTUS today if he could, and the entire Legislative Branch seems to agree. An unconcerned Dr. Smith allows a government shutdown from the partisan back-n-forth, thinking the nation’s leadership will eventually come to its senses. 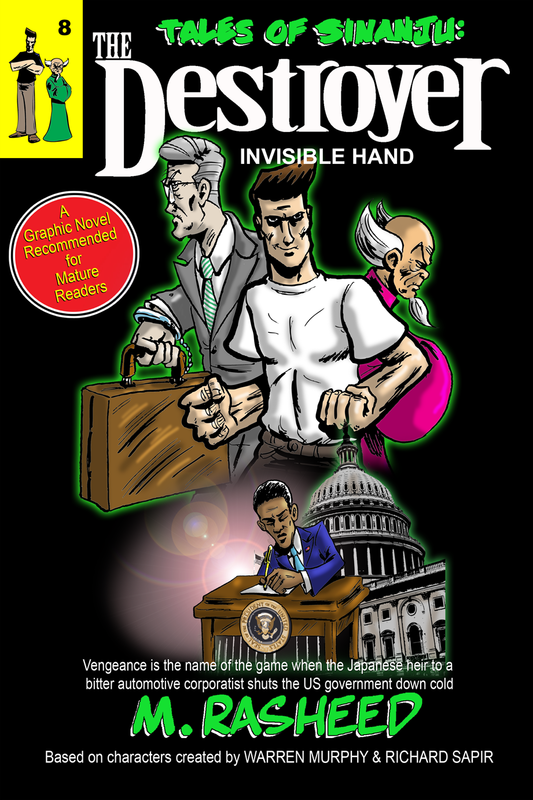 But all isn’t what it seems, and CURE sends Remo and Chiun to confront the fiery Congressman Civiletti before his right-on-time rhetoric sends the federal government plummeting towards an outcome that even their potent skills cannot save it from. >>SNEAK PEEK! ENTWINED DESTINIES – Kim Jong-Un shares his love of basketball with a trusted, life-long protector who’s been more friend than bodyguard. 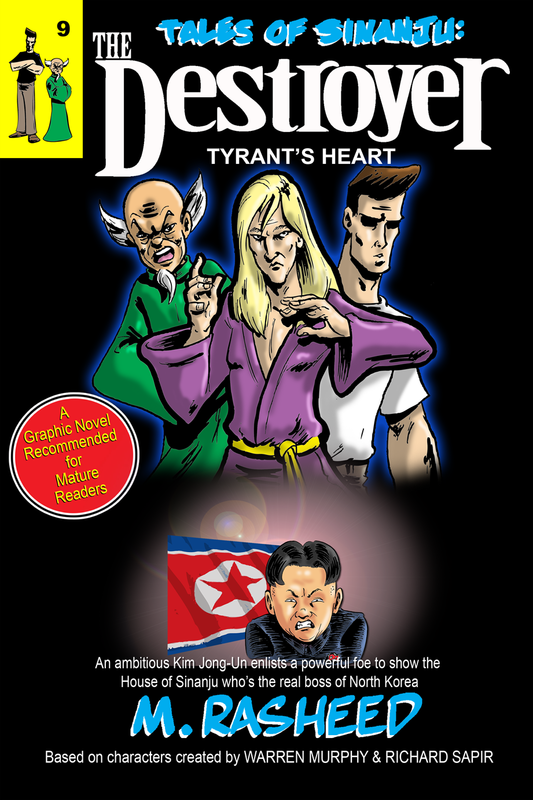 Upon the death of Jong-Un’s father, the mysterious figure seems to gain his own ambitions, and now his young boss has become top dog of North Korea. The newly-crowned Supreme Leader of the Democratic People’s Republic of Korea immediately declares war against the USA, and a certain tiny fishing village on the West Korea Bay! 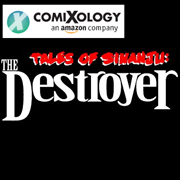 Suspecting a trap, Dr. Smith sends Remo after Jong-Un, but will the Destroyer arrive in time to save his adopted home... or avenge it? >>SNEAK PEEK! 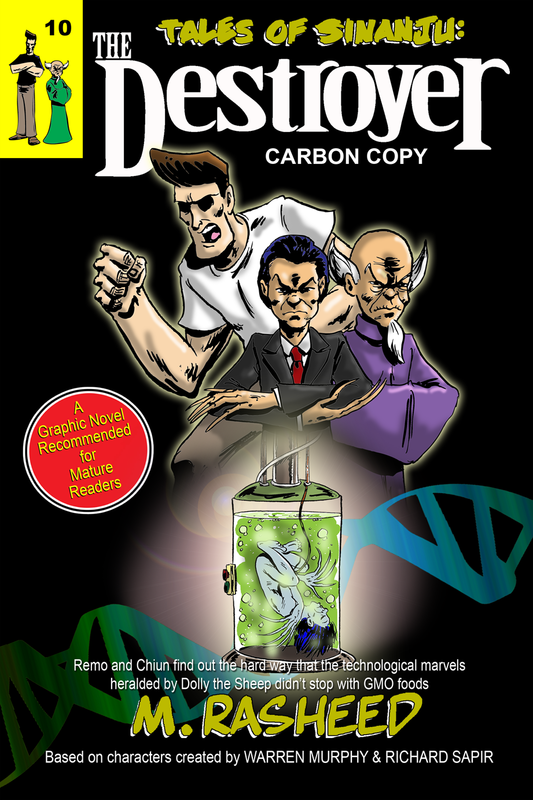 UNHOLY RESURRECTION - Within the halls of a top stem cell research facility, Ze Chow-Fan manipulates a very special set of RNA material. Unleashing the one being that causes both friends and enemies of the House of Sinanju alike to take notice, Chow-Fan holds the reigns of the ultimate revenge scheme, and now he gets to call the shots. The blast from the past proves to be a wake up call for Remo and Chiun, who find that they will need all of their ancient lore (and then some!) to stop the evil mind lurking in the shadows. >>SNEAK PEEK!